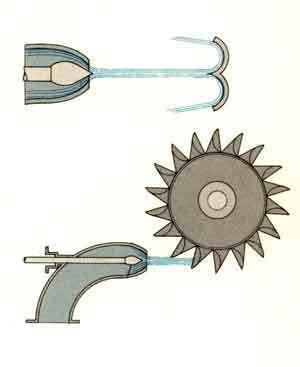 Impulse turbines like the Pelton where The force of water from a stationary nozzle strikes the "buckets"
The third type, Combination turbines, usually have both an impulse and a reaction component. 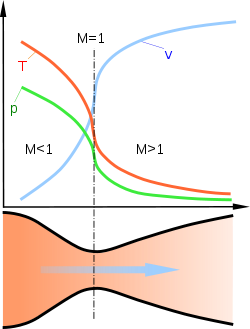 while the remaining portion of the blade has an airfoil shape and produces a reaction within the disc. 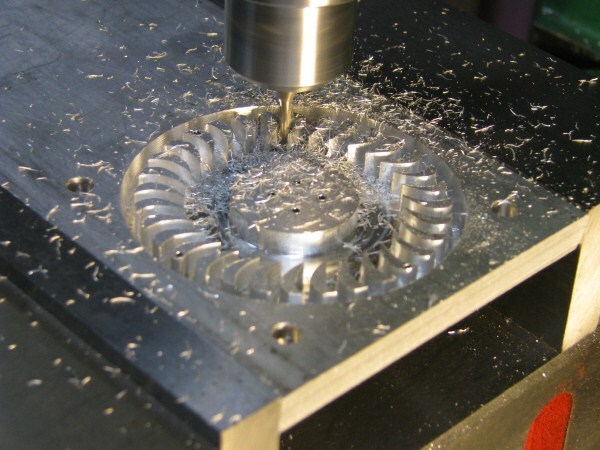 Click on the image below and watch a video of the rotor being milled on my home-made CNC mill. 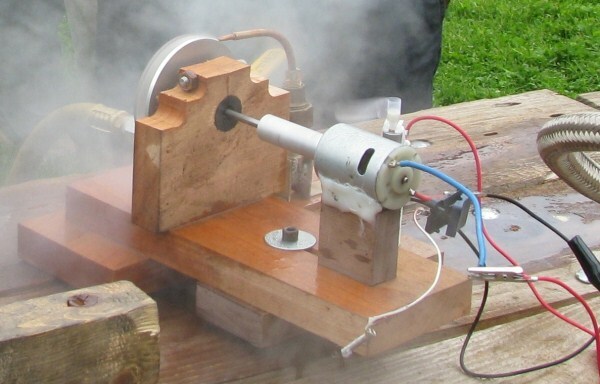 increasing steam velocity while lowering the steam's temperature and pressure. 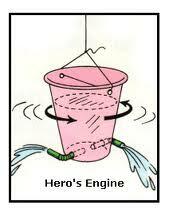 Since the turbine is to be used in a model boat it is directly connected to a 24 Volt DC motor running as a generator. In this way, the power produced by the turbine can be used to run an electric motor connected to the prop with the remainder being stored in a set of batteries. If the turbine is connected to a constant output boiler the boat can continue to run when the boiler shuts down. Very handy! 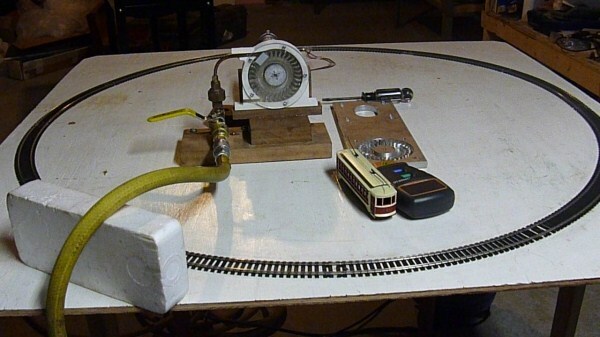 Here's an April 2012 updated version of a video of an HO trolley running on the turbine that I took to Cabin Fever in January, 2012. It was running on compressed air and ran continuously for about 14 hours. Click on the picture below. Here's a video of the rotor running on live steam in May 2011. Click on the picture below. For the full article subscribe to Steamboating Magazine and ask for a copy of the May/June 2012 issue. 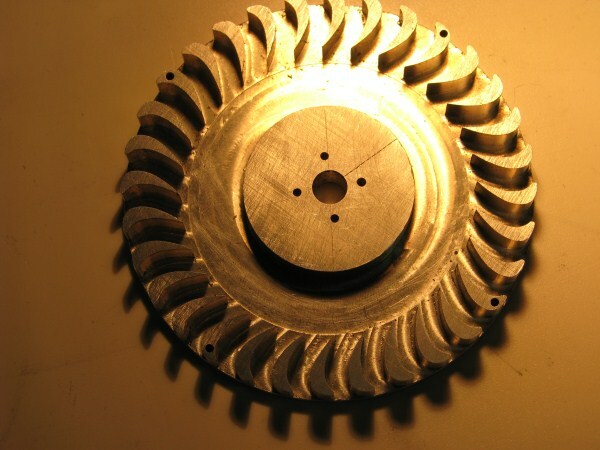 If you have access to a cnc mill, intend to build a turbine using this disc, and you are willing to keep in contact with me regarding your progress, I will email you a copy of the article in the .PDF format at no cost. Please remember that your project may not use the G-code for commercial purposes and must include a comment line attributing the original code to me (Earl Morse) via Steamboating Magazine. In addition, there are a good number of FREE ebooks on old steam turbines available through Amozon, Google Books, Openlibrary.org, Project Gutenberg etc. OpenLibrary, for example, shows 55 free books most can be read in pdf format with very clear illustrations, at various levels of sophistication. Please note that G-code is for personal, one-off use, only. Not for commercial use! You may have to right click on links below and choose "save as" option to save in "downloads". .dxf FILE FOR DISC BLADE COVER. that allows rotation and close examination of drawings.